When Amy Faircloth was sworn in earlier this month as Penobscot County probate judge, she was congratulated by family, friends and colleagues — and by Brandi, the county’s unofficial canine mascot. 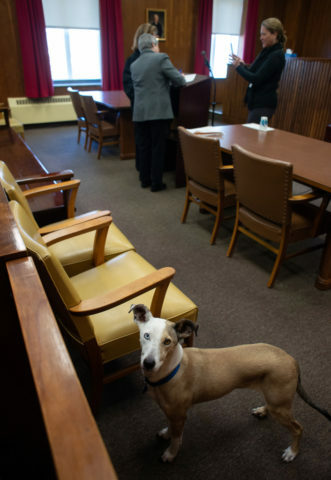 A 5-year-old whippet mix with one blue and one brown eye, Brandi eagerly lifted her paw to shake the judge’s hand Jan. 2 in the well of the probate court. The dog, owned by Register of Probate Renee Stupak, has become a fixture at the historic courthouse on Hammond Street where the county’s probate court proceedings take place. She appears to be the only dog who regularly spends time interacting with the public in a Maine courthouse. 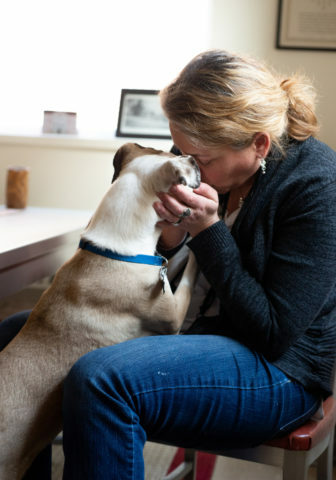 Brandi, a 5-year-old whippet mix, goes to work every day with her owner, Register of Probate Renee Stupak. The dog has become a fixture at the historic courthouse on Hammond Street. Maine’s probate courts handle name changes, adoptions, guardianship matters and estates. The court proceeding can be stressful for litigants, especially children, Stupak said. That’s where Brandi comes in. Brandi was rescued by family friends of Stupak. When they retired to Puerto Rico 2½ years ago, Stupak took her in. Brandi’s role as the unofficial therapy dog at the probate court evolved as Stupak brought her to the office and watched her interact with county coworkers, attorneys and litigants. When she began bringing Brandi to work, Stupak said, a county employee expressed some concern about the appropriateness of having a dog in the courthouse every day. But as Brandi’s fan base grew, those doubts subsided. Brandi gets lots of love and attention at work, but there is never too much from her owner, Renee Stupak. Several county employees now keep treats in their offices for Brandi. The dog is not a fan of the large marble staircase in the building’s three-story building, so she rides the elevator with Stupak. Judy Alexander, Penobscot County’s director of finance, keeps treats and a bed for Brandi in her third-floor office. Barbara Veilleux, director of Unorganized Territory Administration, agreed. Brandi seems to sense when people need comforting, Stupak said. A woman who came to court for an adult guardianship proceeding was nervous and stressed until Brandi greeted her. During the hearing, the woman sat alone at a table in the courtroom and Brandi lay down on her feet. Brandi, a five-year-old whippet mix, is a familiar face at the historic Penobscot County Courthouse where she goes to work daily with her owner, Register of Probate Renee Stupak. Even though Brandi is not a trained therapy dog, she calms many people who are going through difficult situations. Stupak usually takes Brandi to her nearby home for the day at about 1:30 p.m. so she can spend the afternoon looking out the window for squirrels. The practice of allowing therapy dogs in courthouses is growing, according to the Bellevue, Washington-based Courthouse Dogs Foundation. The foundation’s website lists 193 dogs working in courthouses or with children’s advocacy groups in 39 states, but not in Maine. Brandi is not a trained therapy dog. Courts, police departments and other agencies use the dogs most often to help children who have been abused to relax and feel comfortable talking to police or testifying in court about what happened to them. That is how the Suffolk County district attorney’s office in Boston began using Indy, a golden retriever and Labrador mix, 4½ years ago. Brandi is not the first dog to roam the halls of the historic Penobscot County Courthouse. In 2012 and 2013, the county’s head of courthouse maintenance, Tom Duffy, often brought Mickey to work with him. Duffy had adopted the border collie after he suffered serious injuries from his previous owner. Duffy died in 2014, but he created The Mickey Duffy Trust Fund for Animal Rescue in his will. Can’t get enough of Brandi? Follow us on Instagram for more adorable photos.